Vetoryl is a treatment for hyperadrenocorticism, otherwise known as Cushings disease in dogs. Trilostane, the main ingredient in Vetoryl, controls the adrenal gland's excess production of cortisol. By regulating cortisol production, Vetoryl calms the amount of the hormone released into the bloodstream during times of stress which is in flux in dogs with Cushings disease. Vetoryl requires a prescription from your veterinarian. Do not give your dog Vetoryl is they have any kidney or liver diseases. Vetoryl should not be given to dogs who are pregnant. If your dog suffers an allergic reaction such as hives, swelling of lips, tongue or face or difficulty breathing while taking Vetoryl, seek immediate emergency veterinary medical attention and discontinue dosages. Less serious side effects such as unexpected decrease in appetite, vomiting, diarrhea, and lethargy may occur. Call your veterinarian if you see any side effects that seems unusual or bothersome to the animal while they are taking Vetoryl. Vetoryl dosage is based on your dog’s weight. Follow directions as prescribed by your veterinarian. 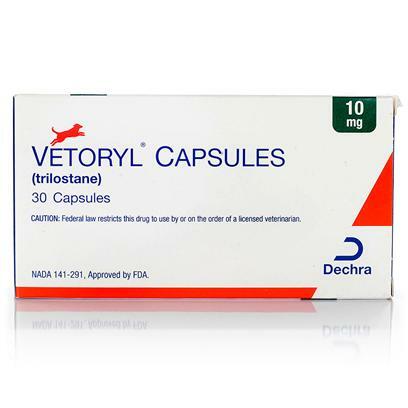 Vetoryl capsules should be taken with food.